Extinction is forever, but environmental victories... not so much. Five years after we thought we'd won the Heller Caves fight, the same company, Catharine Properties, plans to apply for a permit to construct a quarry impacting 100 acres in the same area along the Lower Trail. Extinction is forever, but environmental victories... not so much. Five years after we thought we'd won the Heller Caves fight, the same company, Catharine Properties, plans to apply for a permit to construct a quarry impacting 100 acres in the same area along the Lower Trail. The property is owned by Clifford Wise, who also owns Catharine Properties, as well as Gulf Trading & Transport, LLC. Mr. Wise and other company officials; their engineer, Michelle Merrow; and DEP’s Chief of Technical Services in Ebensburg, Rock Martin, were present at a special meeting held by Catharine Township Supervisors on February 7. About 75 concerned citizens attended the meeting to find out exactly what Mr. Wise intends to do on his property. Although we received very few details about the proposed mining operation, what we did hear was enough to convince many that the environmental degradation caused by a quarry in such a sensitive habitat far outweighed any economic benefits. A quarry so close to the Lower Trail would create a tremendous amount of noise, dust, heavy truck traffic, and would potentially destroy the critical habitat for a small invertebrate called a springtail, which has been found in the cave system. This species of springtail has been found nowhere else on Earth and has been proposed for listing on the Endangered Species List. 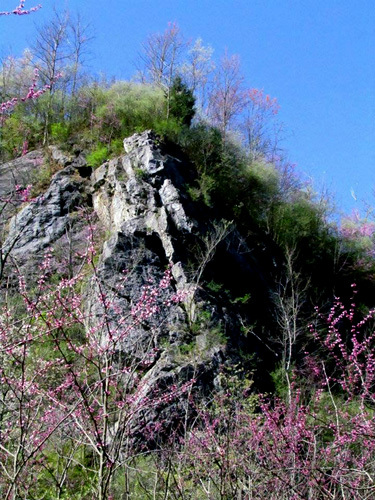 Heller Caves, located in the Heller Caves Biological Diversity Area, adjacent to the Lower Trail, not only contains this rare species of springtail, but also serves as important habitat for rare bat species. The Pennsylvania Game Commission (PGC), which protects our birds and the bats, requested protection for the Caves and the surrounding forested habitat, but their recommendations were ignored by DEP when the first permit was granted. Fortunately, a new chief is now head of the DEP Mining Office in Ebensburg. Chief Martin assured the audience that this time DEP would adhere to the PGC recommendations. He also stated it typically takes DEP from four to six months to analyze applications and that the application has not yet been submitted. Meetings are held at the Municipal Building at 1229 Recreation Drive, Williamsburg, Pa.